I've been meaning to watch Before Dawn for years now, I just couldn't pass up the opportunity to see Emmerdale's Paddy (Dominic Brunt) battling the undead, I even did a news post on the film back in 2013 (here). As it's my birthday at the time of writing (13th February) I thought there was no better time for watching a zombie horror. You can tell this is a zombie film as the cover features thousands of zombies and a ruined cityscape despite not featuring either (I just do not understand why the vast majority of zombie films feels the desperate urge to feature that as their cover image). Brunt stars as city dweller Paddy...sorry, I mean Alex who after leaving his young children with their Nan heads out to a remote cottage in the countryside with his wife Meg (Joanne Mitchell). The couple have been having relationship troubles and Alex hopes a romantic weekend away is just what they need to sort out their issues. Even before life threatening trouble begins things aren't going smoothly for the two, but it is the arrival of the undead that dashes the final hopes of Alex for saving his marriage. Brunt and Mitchell are married in real life and so this lends a more realistic dynamic to the troubled film couples situation, it is said that the idea of doing this zombie film came from an actual disagreement the two had over how to make a good zombie film. As well as star in Before Dawn Mitchell is credited for the story, while Brunt is the films director. This had quite a slow start, those expecting immediate action will be disappointed as for the first half hour or so it is all drama, and actually did remind me a bit of a soap opera. Like the mystery of just how zombie apocalypse supposedly came about there is also some mystery on just why the marriage is not going well. There are hints of infidelity, and of maybe Alex losing his job being the cause, and both characters are certainly flawed people but it is never explicitly spelled out. 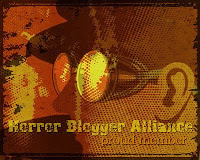 There are a few hints of the terror to come but when the horror does arrive it is swift and unexpected. 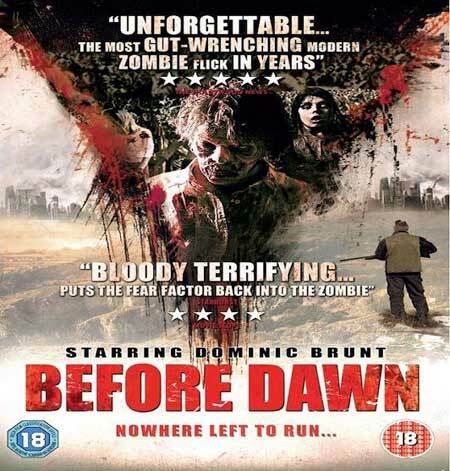 The undead of Before Dawn are very much aping the style of the rage infected from the 28 Days Later and 28 Weeks Later films. The zombies are full of boundless energy being very fast on their feet, while their constant growls and jerky head movements seem to portray a great deal of anger. The editing is also very reminiscent of those popular films with short snappy cuts during action sequences that give a sense of confusion and panic over just what is happening. The zombies themselves while short in number all look fantastically messed up with red eyes and deformed teeth and coated in blood, they do truly look freaky as heck and so delight. The action occurs in short spurts, a chase sequence, a prolonged encounter in an enclosed space, a short siege all come about and don't outstay their welcome but satisfy in their visceral stylings (such as a poker through the face of one of the ghouls). The meat of the film is instead Alex's failing marriage, it is sad that even when things are not going well his wife still seems to have given up. She just doesn't give Alex a break, while he just can't seem to see how bad things have gotten between them. When things go south he is still so preoccupied with this personal situation that he makes some really bad decisions that have some very tragic consequences. For all his flaws you do care about Alex and made me wonder what I would have done differently if I had been him and mad with grief. The plot is simple enough, it is inferred that this swift zombie apocalypse is wide spread yet we are never shown much of this other than a second hand account by a wandering side character (Alan French also of Emmerdale). In a way this works, by showing such a limited view of the outside mayhem we are made to be as insular and preoccupied as Alex whilst also conveniently saving on budget. After a somewhat slow start this turned into quite an interesting, though ultimately bleak little English zombie film. I'm unsure of the drum and bass music that starts up during the zombie attack sequences but the make up on the undead is pretty stellar and the small cast were well chosen leading to an interesting film that maybe occasionally cribs too much from more popular examples in the genre.